1st Ned Leeds. Amazing Spider-Man #18. Fantastic Four and Sandman Appearance. Off-White Pages. Published by Marvel Comics Group in November 1969. All our comics are despatched in plastic sleeves with backing boards, within stiff card-backed envelopes for maximum protection. Each comic will be bagged and boarded unless otherwise stated. In my opinion, this book looks near perfect high grade! The book is 100% complete and firmly attached at the staples. The Amazing Spider-man #39 Marvel Comics. Condition is Used. Looks great for its age. See photos for details of condition as hasn’t been graded. I would estimate VG to F. Dispatched with Royal Mail 1st Class Large Letter. Am listing several issues and happy to combine postage costs if you win multiples. No 44 has cover writing (probably acceptance date) and has an ad cut out, which doesn't affect the story. No. 46 is a U.K. Edition. 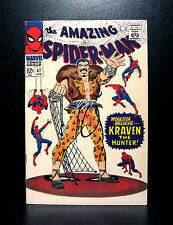 Amazing Spider-Man #17 GD/2.0 SIGNED BY STAN LEE! KEY ISSUE!L@@K! Signed by the Stan Lee. 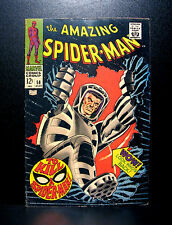 Up for sale is a Silver Age comic book, presenting Amazing Spider-Man #17. Amazing Spider-Man #17. The comic is in very nice shape with great color and has no missing or torn pages however there is a subscription crease down the center of the book and a very small rip at the top of the centerfold. 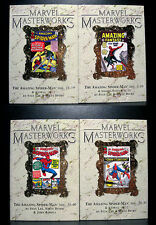 The Amazing Spider-man #33 Marvel Comics. Condition is Used. Looks great for its age. See photos for details of condition as hasn’t been graded. Dispatched with Royal Mail 1st Class Large Letter. Am listing several issues and happy to combine postage costs if you win multiples. Amazing Spider-Man 50 cgc 6.5 White Pages! 1st appearance of Kingpin! Shipping will be $12.95, SUPER Fast, secure and safe! See all pics! Any questions please ask! AMAZING SPIDER-MAN 3 - CGC G/VG 2.0 - 1ST APPEARANCE OF DOCTOR OCTOPUS (1963). Shipped with USPS Priority Mail. VENOMVERSE #1 CBCS 9.8 CLAYTON CRAIN ULTIMATE EDITION Limited to 250 copies world wide. Any questions please ask. Happy bidding. Published by Marvel Comics Group in August 1968. All our comics are despatched in plastic sleeves with backing boards, within stiff card-backed envelopes for maximum protection. Each comic will be bagged and boarded unless otherwise stated. John Hauser Comics has over 30 years experience in comic books. (except CGC & PGX graded comics). The Amazing Spider-man #42 in fair condition. Professional and ACCURATE grading! Lower grade reading reading copy. 1ST APPEARANCE CAROL DANVERS AS MS. MARVEL. CGC 8.5 with White Pages. Up for sale is MS. MARVEL #1. We have over 20 years in biz. That is the only reason we appear new! The Amazing Spider-man #40 Marvel Comics. Condition is Used. Looks great for its age. See photos for details of condition as hasn’t been graded. I would estimate VG to F. Dispatched with Royal Mail 1st Class Large Letter. Am listing several issues and happy to combine postage costs if you win multiples. The Amazing Spiderman #41 1st Appearance of The Rhino! Solid VG Condition!!. Shipped with USPS First Class Package. Last Ditko Spider-Man Shipped with USPS Priority Mail. Scan shown is of the actual comic(s). In my opinion, this book looks near perfect high grade! The book is 100% complete and firmly attached at the staples. There is just a small amount of color touch on the cover. Amazing Spider-Man lot in Good to Very Good condition. Issue 78 is VG. 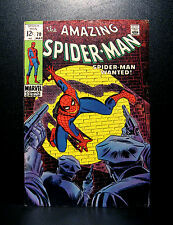 The Amazing Spider-man #29 Marvel Comics. Condition is Used. Looks great for its age. See photos for details of condition as hasn’t been graded. Dispatched with Royal Mail 1st Class Large Letter. Am listing several issues and happy to combine postage costs if you win multiples. This book features the first-ever appearance of TWO huge characters in not only the Spider-Man corner of the Marvel Universe, but the Marvel Universe as a whole - Gwen Stacy and Harry Osborn! Condition-wise, I'd consider this book to be in the GD range. Are 9.99 for the 1st and 5 each after that in the USA, 17 bucks and 8.50 combined for Canada and 27 bucks and 13.50 combined for international.CGC books. Silver Age Marvel issue Amazing Spider-Man No. 41, October 1966, featuring 1st appearance of the Rhino. Solid VG- 3.5 to VG 4.0 condition, with general surface and edge wear to cover. Interior is in excellent condition, with off-white pages, tight centerfold, a few small page corner folds, and no creasing, tears, or missing pieces. Interior is in excellent condition, with off-white pages, tight centerfold, and no creasing, tears, or missing pieces. No reserve. Amazing Spider-Man 2 CGC 2.5 | Marvel 1963 | 1st app The Vulture! Steve Ditko! 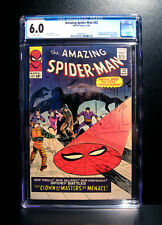 Up for your consideration is Amazing Spider-Man 2 CGC 2.5 | Marvel 1963 | 1st app The Vulture! Steve Ditko! . Lot of 1 Books containing; Amazing Spider-Man 2 CGC 2.5 | Marvel 1963 | 1st app The Vulture (Adrian Toomes) and the Terrible Tinkerer (Phineas Mason).